Totals on Android + Introducing Apoorv! 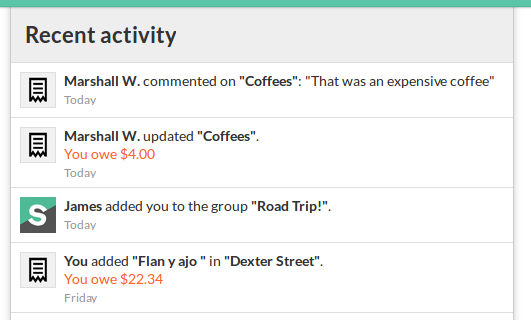 Splitwise for Android v 3.6.5 introduces spending totals for groups. We’re thrilled about this for two reasons: one, totals have been our Android community’s most popularly requested feature for a while now. Two, it marks the first time our users are seeing Apoorv’s work in action! Apoorv Khatreja is Splitwise’s newest mobile engineer. He joined the team in October 2015 and is presently focusing on Android. We love having Apoorv on board and can’t think of a better way for our Android users to ‘meet’ him. To access spending totals for your groups, navigate to the relevant group screen and tap the ‘vertical dots’ icon in the upper right hand corner of the group screen. Then tap ‘View spending totals’. The resulting totals screen answers three important questions: How much did our group spend, in total? How much did I pay for, in total? And finally: How much do I owe, in total? You can see this information across three time periods: all time, this month, and last month. For now we are only summing across expenses added in your default currency. We recognize this may make the feature suboptimal for folks who are using Splitwise for foreign travel expenses. As a work-around for now you can temporarily change your default currency from your account settings screen. Another enhancement introduced in 3.6.5 is the ability to zoom in on image uploads. Posted on November 5, 2015 November 5, 2015 Author Zoe ChavesCategories UncategorizedTags Android, new featuresLeave a comment on Totals on Android + Introducing Apoorv! Recent activity feed, on web. The team is happy announce the release of a broad set of improvements to how Splitwise notifications are generated and presented. Usability and ease-of-knowing-what’s-up are going to skyrocket thanks to an improved ‘Recent activity’ feed (now on mobile, too) and more sophisticated push notifications. All 3 of our devs — Ryan, Marshall and Caleb — have been hard at work on this effort since December, when we introduced expense comments for the web and decided to really commit to building out notifications. Marshall and Caleb have focused on Android and iPhone respectively, with Ryan taking care of back end stuff, the web experience and overall look of the new features. We made these changes to eliminate all possible sources of confusion when viewing Splitwise, because confusion causes uncertainty and stress! We’re waiting eagerly for your feedback on the changes, at feedback@splitwise.com. Take the leap to see a more in-depth explanation of the changes. You’ve been very patient as we’ve toiled to bring our Android app up to speed with the iPhone app in features and stability. Like many of you out there, I’ve been waiting for BillMonk to load. Why am I waiting? I’ve been testing our new importer for BillMonk data. In the last week, BillMonk has sadly gone from slow to unbearable. While this is painful for their users, we hope we can provide a fairly painless process to move from BillMonk to Splitwise.